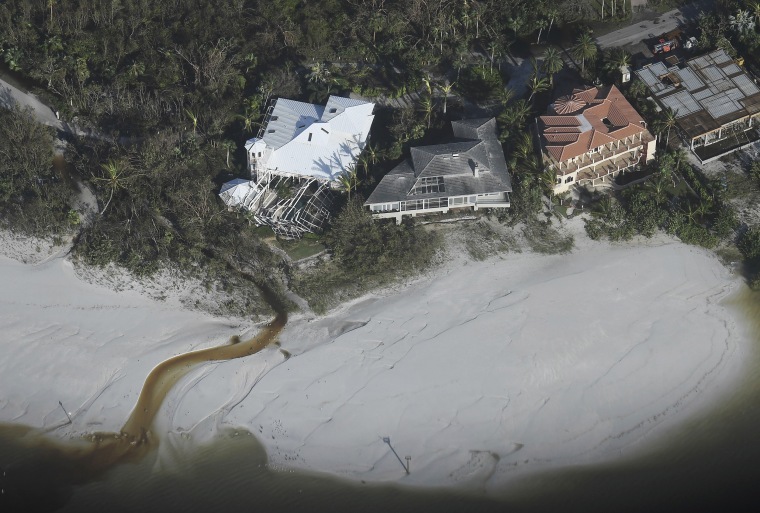 Damaged houses line the beach on the southwest coast of Florida on Sept. 11. 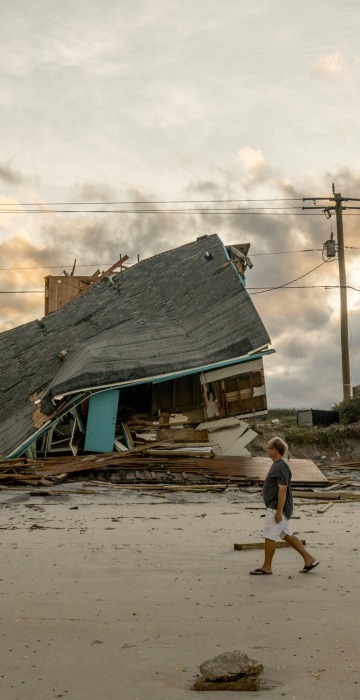 Hurricane Irma hit southwest Florida on Sunday morning as a dangerous Category 4 storm, the second-highest level on the five-step Saffir-Simpson scale. It gradually weakened as it headed through the state, becoming a tropical storm and then a tropical depression on Monday. 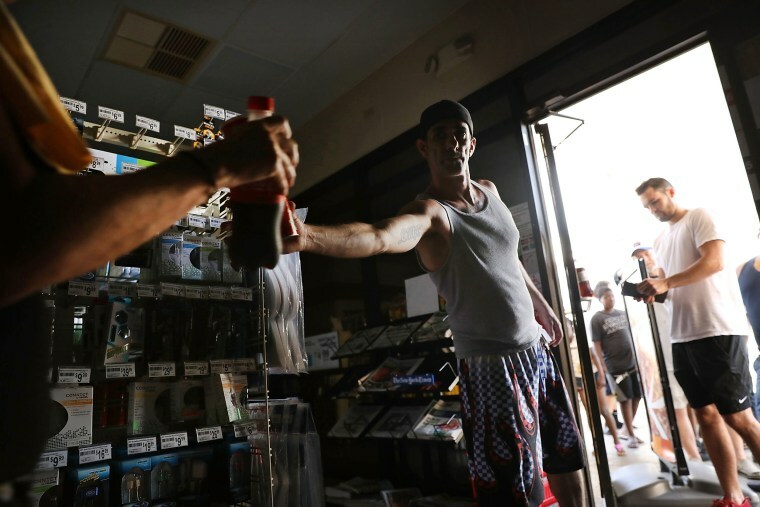 Employees at a 7-Eleven sell a limited amount of groceries to desperate customers following the loss of electricity and the closing of most stores in the area on Sept. 11 in Naples. 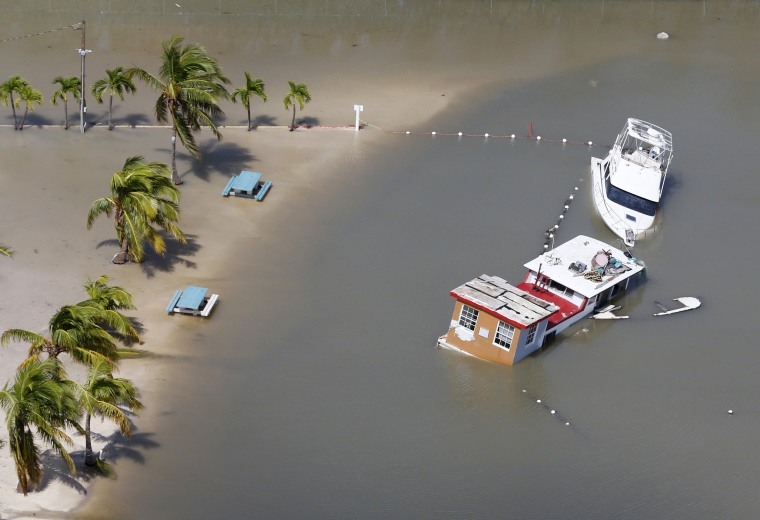 Partially submerged boats lie in the water in Key Largo on Sept. 11. Justin Hand navigates storm surgefrom Hurricane Irma along the St. Johns River in Jacksonville on Sept. 11. Flooding in downtown Jacksonville along the river topped a record set during Hurricane Dora in 1965. 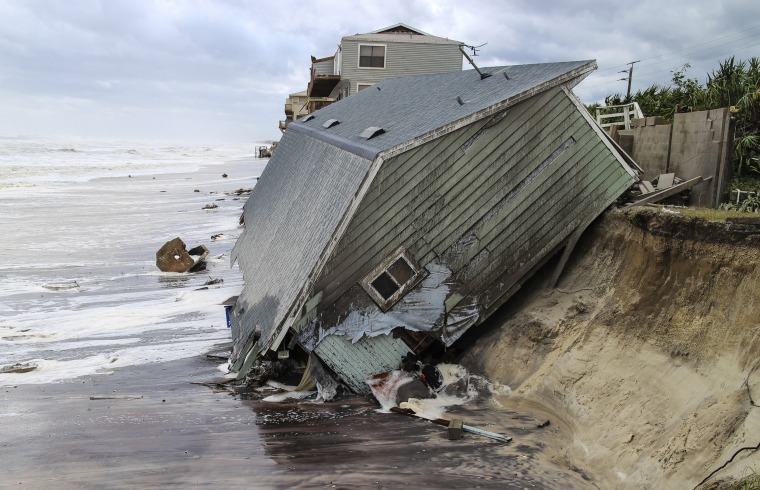 A house slides into the Atlantic Ocean in Ponte Vedra Beach on Sept. 11. 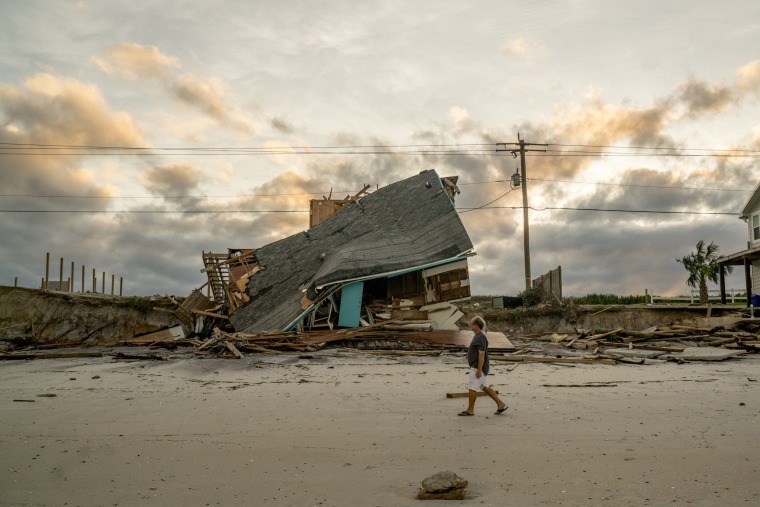 A man walks past a collapsed home on Vilano Beach outside St. Augustine on Sept. 11. About 70 percent of the city remained without electricity Monday. 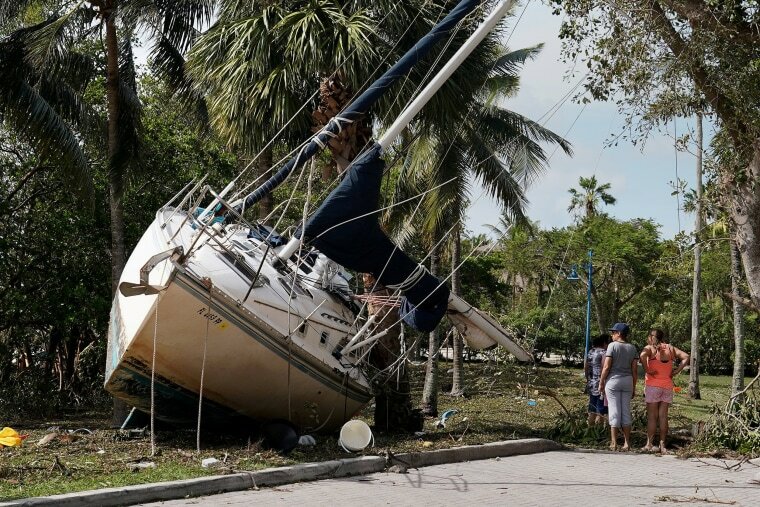 People stand next to a boat that was washed ashore in Miami's Coconut Grove on Sept. 11. 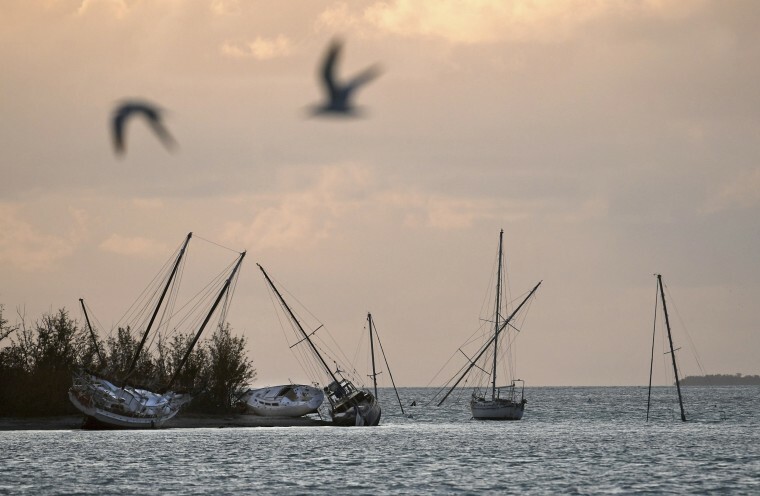 Masts stick out of the water from several submerged sailboats in Key West on Sept. 11. 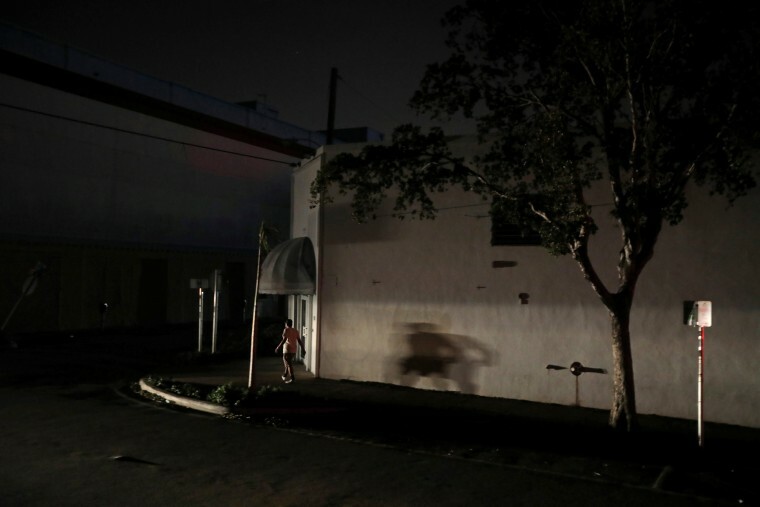 A man walks in the darkness in Little Havana as many areas of Miami were still without electricity early on Sept. 11. 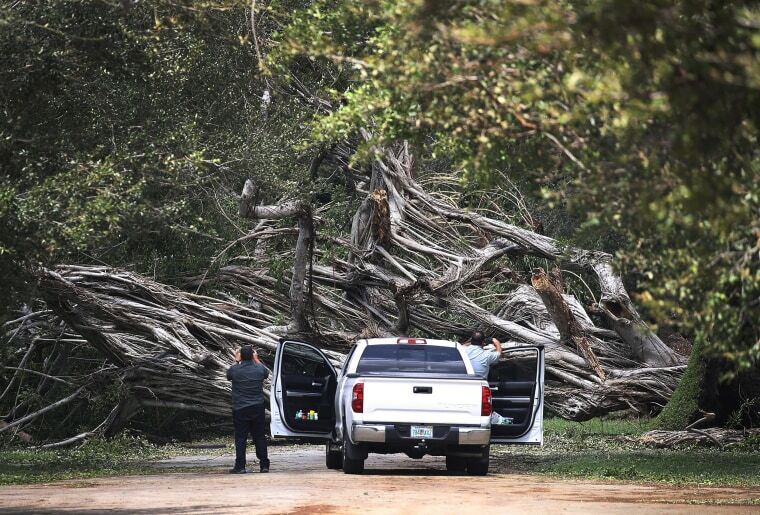 A tree blocks a road after it was downed by winds from Hurricane Irma on Sept. 11 in Miami. 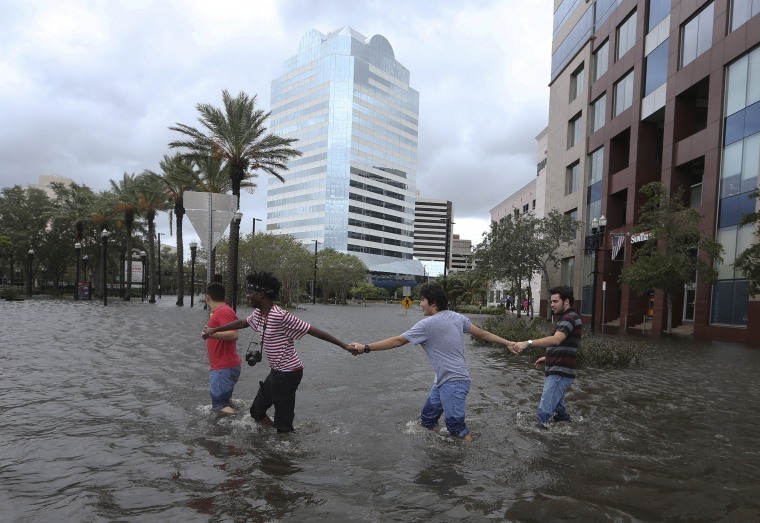 People link arms as they explore the flooded Jacksonville Landing on Sept. 11 in Jacksonville. 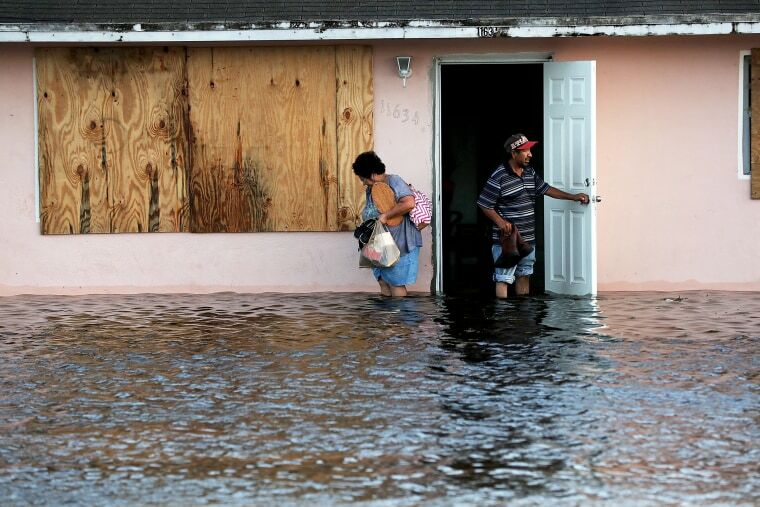 A couple leaves their flooded home in Fort Myers the morning after Hurricane Irma swept through the state on Sept. 11. Hotel guests are served breakfast by lamplight as the power remains off at the Courtyard by Marriott in Fort Lauderdale on Sept. 11. Neighbors embrace while clearing fallen trees and brush outside their homes along Bayshore Blvd in Tampa on Sept. 11. A trailer home which had its front wall ripped off by hurricane winds near Naples on Sept. 11. Kelly McClenthen returns to see the flood damage to her home with her boyfriend Daniel Harrison in the aftermath of Hurricane Irma in Bonita Springs on Sept. 11. A man looks at the damaged roof of a gas station that succumbed to Irma's winds in Bonita Springs on Sept. 11. Rick Freedman checks his neighbor's damage from Hurricane Irma on Marco Island on Sept. 11. 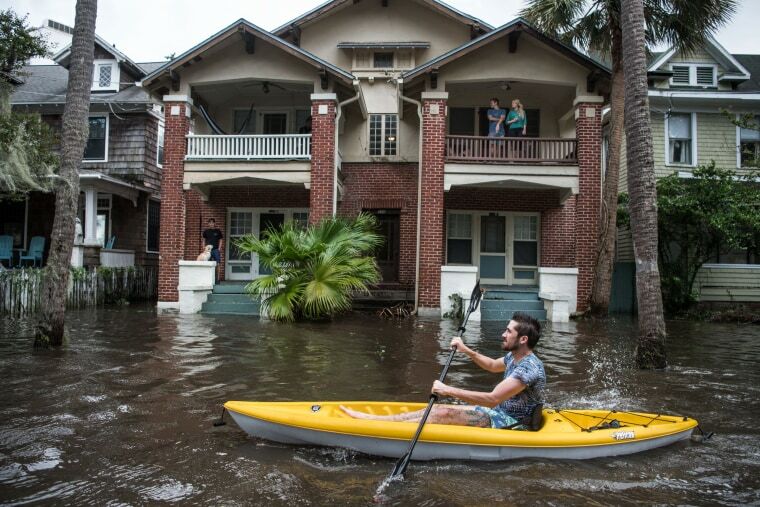 Local resident Vishnu Obregon surveys the flooding in the Brickell neighborhood of Miami on Sept. 10, 2017. Downed trees and a windblown trampoline block a street in Pompano Beach on Sept.10. Partially submerged boats sit in a marina in downtown Miami on Sept. 11. A teen walks through flooded streets the morning after Hurricane Irma swept through Naples on Sept. 11. A large tree lays on top of a home in Fort Meade on Sept. 11. With power out to her entire neighborhood and the surrounding area, Marissa Calderon uses a gas grill to make scrambled eggs, hot dogs and tortillas for her brother and young cousins, in Bowling Green on Sept. 11. Gonzalo Saldivar and his one year-old son Luke get their first look at the roof that flew off of their home and landed at a nearby intersection in Bowling Green on Sept. 11. 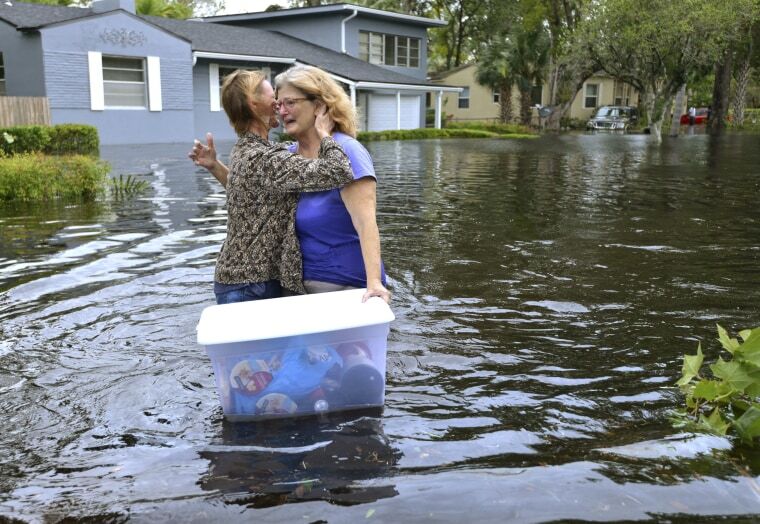 Charlotte Glaze gives Donna Lamb a teary hug as she floats out some of her belongings in floodwaters from the Ortega River in Jacksonville, Florida on Sept. 11. Zachary Harrison, his fiance Cheyanne O'Donnell and their three children, Jaiden, 14, Jackson, 9, and Ella, 10-months, get their first look at the damage to their neighborhood caused by Hurricane Irma in Fort Meade on Sept. 11. Blown sand from Pompano Beach coats bushes and mailboxes on Sept. 10. Laura and Joe Raymond pack up their truck to leave the fourth floor apartment of Joe's mother, where they rode out the hurricane, to return to their low lying home a mile away in Marco Island on Sept. 11. A fallen tree took a section of this Lakeland home with it when Irma swept through the state, in the early morning ours of Sept. 11.